I all! I haven't been here for a while, so I was catching up. Is there some sort of website I can use to find flights for specific aircraft I want to fly on? Let's say I want to find where BA is flying their A380s. I believe it to be possible to search on the ITA matrix, bar that I do not think such a tool exists yet. I guess I was a Google search away. If you mean doing a self-transfer at the gate at ALG, my experience the other day was that this is impossible. Arriving pax were routed straight to passport control, no chance to "get lost neat the gate" as you never enter the departure lounge. On the plus side, Algeria is a great destination and I will certainly go back before long. Are you referring to a type B2B transit, then you're propably right. In the ALG-JFK thread it was disadvised to B2B, but even arriving from the same country, as Vueling has a very early flight BCN-ALG, that would let you have the time needed for the transfer. I'm not advocating any 'self-transfer at the gate', or to 'get lost near the gate' in a country like Algeria, or in any visa requiring country. Because of your very definite statement, I called the consular section of the Algerian embassy, describing my plans to fly in from Paris in the morning, not leaving the airport, departing for Madrid early afternoon.The man, to whom the call was transferred, was very clear. "Like all over the world, you don't need a visa if not leaving the airport". There are , of course exceptions from this in some countries, but that was the official Algerian policy. The B2B situation was , however, disadvised. Also the return to the same country was not really a 'transfer' in the visa aspect, however much it was in the flying aspect. There was never any mentioning of what passport I held, and possible implications on the same situation. With the tier points, I actually made it 800 - 80, 140, 140, 40, 40, 140, 140, 80, so even better and then the positioning flights add a few more in there too. Very nice indeed. BUD-LHR in business is only 40TP, not 80TP. So it's 720TP total. But you could make it 80TP (and 800TP total) by nesting a LHR-BUD CE positioning return flight of your own accord. That's unlikely to be particularly cost effective, however. 200TPs in a day is a stretch. I would look at doing LHR/HEL/ARN for 240 TPs and around £500. No need for Saturday night and you might get the A350. Also, you don’t need yo panic about 8 June. You can usually get ab2 week extension so can fly up to 22/6. You just need to ask for this. How reliable is the "only show flights with available seats" tick box for ITA matrix? Found my ideal itinerary and then discovered I hadn't ticked that! going ex Jersey to any European destination (say AMS) will get 160 TP and usually doesn't cost much more than going ex London. If you set up positioning as B2B on an economy flight, chances are good you'll get a POUG you can apply to one leg for the extra 40 TP. It is possible to set up the positioning (LGW->JER) and the first leg (JER-LGW) in the evening of a weekday, then do the LON->AMS->LON over the weekend,, then a similar evening B2B the next day, I have several trips set up like that. Alternatively it might be possible to do an ex AMS to JER using the same sort of process, depends on how timings work out. You might need the 2 week extension though to get reasonable prices, and the best prices seem to be midweek. Very interesting. I am more worried that AA in the US will require me to have a visa for my final destination and not let me board my flights to the UK! Which is exactly the routing I want, with multiple days in both BWI and SEA and 800 TP. (Although any suggestions for more TP are welcome). I tried to get the LAX/SFO-JFK transcons in, but it caused me to exceed MPM or too many transfers. BWI is badly connected. On the tier point calculator it shows that LHR-OTP in business its 80 tier points. 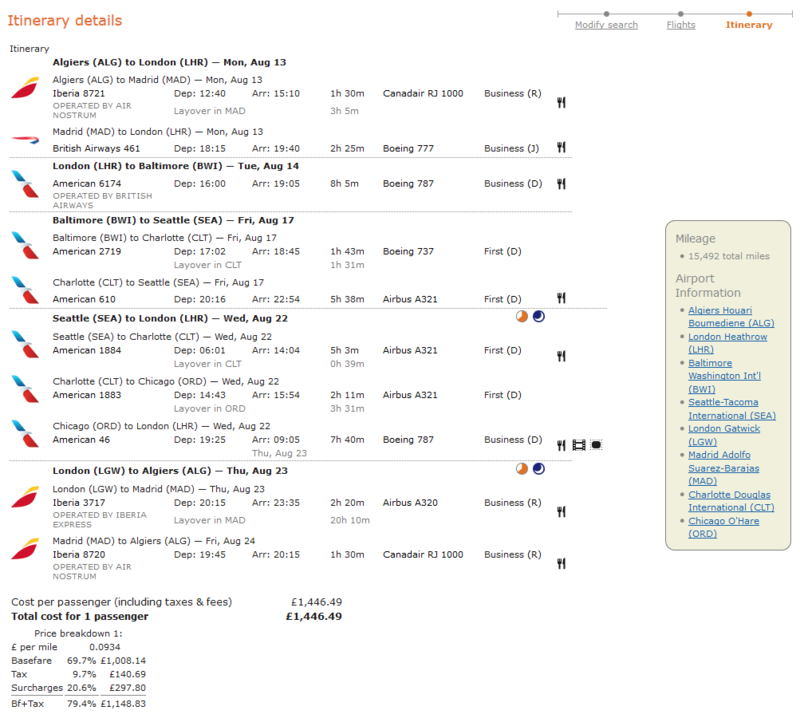 The matrix shows that the flights are J and I booking classes. Not sure if I'm looking at it wrong but it seems to be that. I think someone is mixing up Bucharest with Budapest. greenmeadie and flyuk like this. That might be it; What a difference a few hundred miles makes!